Siple Station was a research station in Antarctica (75°55′00″S 83°55′00″W﻿ / ﻿75.916667°S 83.916667°W﻿ / -75.916667; -83.916667), established in 1973 by Stanford's STAR Lab, to perform experiments that actively probed the magnetosphere using very low frequency (VLF) waves. 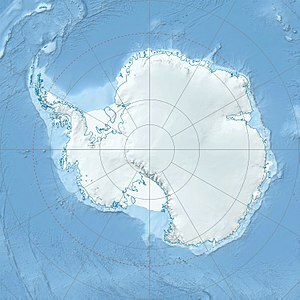 Its location was selected to be near the Earth's south magnetic pole, and the thick ice sheet allowed for a relatively efficient dipole antenna at VLF (very low frequency – 3 kHz range) frequencies. John Katsufrakis of Stanford University was the "father" of the station and the VLF experiment sponsored by Stanford. The station (actually, there were two, Siple I and later Siple II, circa 1979 (built above the original which was eventually crushed by the ice). The original Siple I station had a four-man winter over crew and the later Siple II station had an eight-man winter over crew. Siple Station was closed following program completion in the 1980s. The Siple II station used a 300 kW Kato square wound generator powered by a Caterpillar D353 engine to power the VLF (Jupiter) transmitter which transmitted to a receiver in Roberval, Canada. At the time, the Siple II station had the world's longest dipole antenna. Originally 12 miles long, it was subsequently increased to 24 miles and then a second 24-mile antenna running at 90 degrees was added, resulting in a total antenna length of approximately 50 miles and allowing for phased VLF transmissions. Utah State also housed a high-frequency radar experiment for a few years at the Siple II station. The Siple II station's house power was provided by two 110 kW generators (one active, one standby) powered by 3306 Caterpillar engines. The Siple II building complex was a metal Jamesway structure approximately 280 ft long, 44 ft wide and 24 ft tall. During winter-over operation the facility stored approximately a maximum of 80,000 gallons of DFA (Diesel Fuel Arctic) in three 25,000-gallon fuel bladders. Siple Station was named after Paul Siple, who, as a Boy Scout, was a member of two Byrd expeditions and other Antarctic explorations. This page was last edited on 7 April 2019, at 00:01 (UTC).